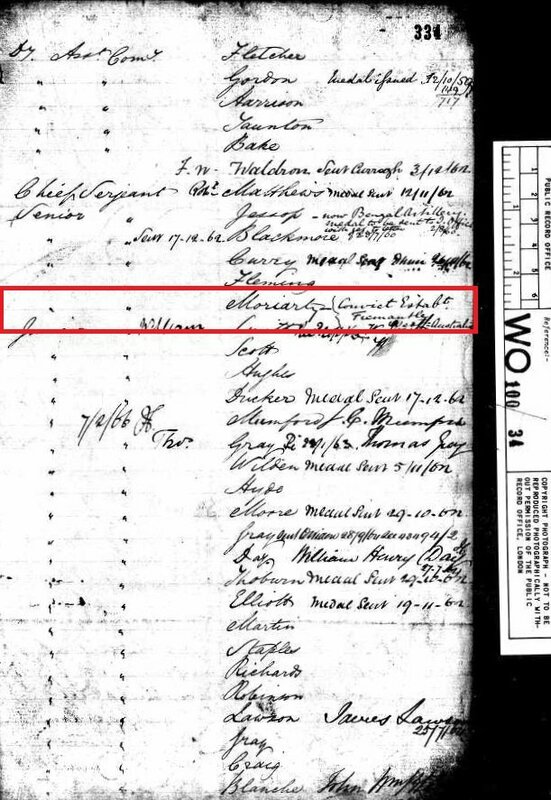 Birth date and place c. 1826 Keel, Milltown, Kerry, Ireland. Physical Description Height: 5 ft. 9¼ ins. Complexion: fresh. Eyes: blue. Hair: fair. Marriage date and place 22 Oct 1855 St Mary Magdalene Church, Woolwich, Kent. Children Honora Agnes Anna b. 1857, outside Australia. Edward John b. 1858, outside Australia. Death date and place 1906 Northcote, Victoria. 5th (Princess Charlotte of Wales’s) Dragoon Guards. Turkish Contingent (c.1855 after discharge from Army). Regiment No. and Rank #2286 (10th Reg. ), #1886 (5th DG) Private. 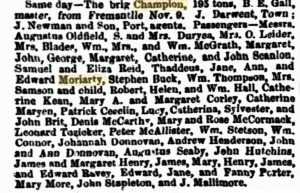 Attestation date and place 27 Jan 1844 Tralee, Kerry (as Thade Moriarty). Service/Campaigns East Indies 13 Nov 1844 to 6 Feb 1847. East Indies 23 Nov 1850 to 5 Feb 1853. Total overseas service 4 years 161 days). Musters 1851 Wazirabad, Pakistan [WO12-2788]. Promotions & Reductions: Private to Corporal 26 Aug 1847 (39th). Corporal to Private 1 Jun 1849 (10th). Private to Corporal 20 Jun 1849 (10th). Corporal to Private 5 Jul 1850 (10th). Senior Sergeant in the Turkish Contingent. 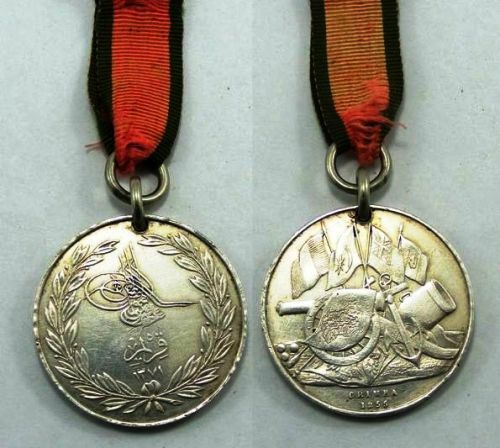 Medals, Clasps and Badges Turkish Crimea Medal. For medal roll entry click here. Casualty/Medical Body has marks of leeching. Right tibia is enlarged and frequently painful especially after drilling and he states this from old venereal disease. It has remained despite of all treatment including Corrigin’s Century and mercurial applications etc. His history is unknown. Unfit for service in consequence of enlargement of right shin bone [Dublin 21 Nov 1853]. 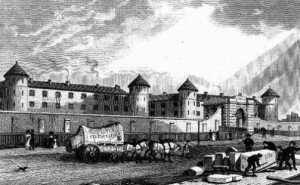 Regimental Courts Martial In Prison 7 Sep 1846 to 1st Oct 1846. Confined 29 Apr 1848 to 8 May 1848. Sentence reduction, punishment remitted. In Prison 2 Jul 1850 to 4 Jul 1850. Reduced to Private. Discharge date and place 13 Dec 1853 Ballincollig, Cork. Length of Service 9 years 269 days. Post Discharge Residence Dingle, Co. Kerry. Post Discharge Pension District Tralee (1853). Turkey (1855). 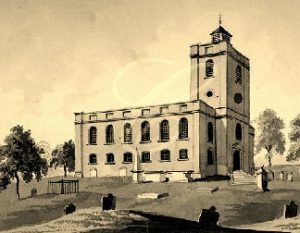 Deptford (1855). Pension Amount 6d. per diem for two years to 23 Dec 1855. 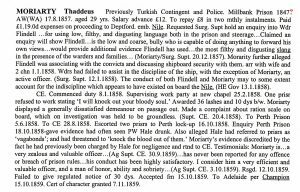 Status/Occupation Assistant Warder, Convict Establishment, Fremantle, Western Australia 1858-1859 (see sidebar). Mounted Police, South Australia 1862 to 1877. See SA Police Gazettes 11 Apr 1862, 19 Jun 1862, 24 Feb 1865, 4 May 1866. Superintendent & Master Boys’ Reformatory, Magill, SA 1877. See SA Government Gazette 6 Dec 1877. Misc. Newspaper Articles Adelaide Observer 10 Dec 1859. 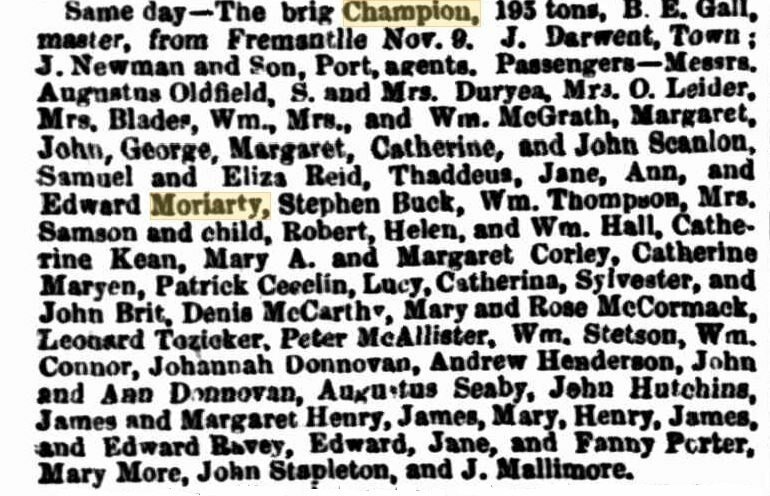 SA Advertiser 9 Apr 1866. SA Register 23 & 24 Feb 1877. For details of ‘Disturbances at Goolwa’ click here. SA Chronicle 15 Dec 1877. Dep. 15 Nov 1859 Fremantle. Arr. 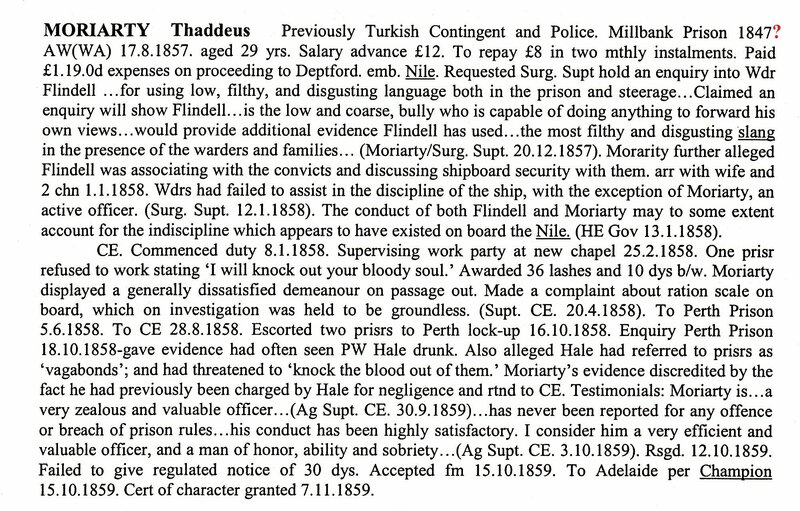 6 Dec 1859 Adelaide.